In this article, we are going to discuss how you can use guest blogging to get contextual, do-follow links from similarly themed blogs with high root PageRank. In the last year, we witnessed the rise of guest blogging as a means to build your online profile. With the release of new Google algorithms, that diminished the effectiveness of many traditional SEO methods, guest posting on other blogs has become the most effective way to get the best inbound links to your content. The reason for this is simple: Guest Blogging adheres to the original intentions of the search engines–one website truly vouching for another. And, as a guest poster–especially if you are a member of Ultimate Guest Blogger–you not only get inbound links from other websites but these inbound links are contextual (the best kind) and do-follow. Many sites that allow guest blogging do not allow this…they simply allow a resource link at the bottom of the page, which is not near as good. Many people obsess endlessly about PageRank on websites, often to the neglect of other important, often more important, concepts as they relate to building your online presence. For example, would you rather have a guest post accepted about “laptop computer reviews” on a high PR site that is about dinosaurs or a low PR site that is about laptop computers? The answer is the low PR site about laptop computers. However, many people, especially the PR obsessed, will still want that link from the dinosaur site if it has a PageRank of 8. Not only is this not a good thing, Google has given signals that this could be penalizing as well. Your link about laptop computers has absolutely nothing to do with dinosaurs and will be seen as a manipulative move on your part. You might just get yanked right out of the Google results. Another thing people forget is this: When you post your guest blog somewhere, it will have no PageRank–zero! It’s a new post so it needs to prove it’s value over time. However, a new post can benefit from being placed on a site with a high root PageRank. It has better chances that way because a site with a high PageRank does not undergo the same level of scrutiny that a new website does. There is something more important than PageRank when it comes to where you post your guest articles and this is the idea of thematic linking. Well, we know what the idea of a theme is. Dictionary.com defines a theme as “a subject of discourse, discussion, meditation, or composition; topic”; Thus, the word thematic simply means “of or pertaining to a theme”. Being of sound mind, we can then reasonably conclude that a link about laptop computers from a dinosaur site is a terrible thematic idea! You’d be amazed at how many people and respectable companies still do this–buying inbound links from shady companies who load them up with unrelated links from “important, high PR” websites. All of these sites are being hurt by this approach. Another idea that people forget is the PageRank lag. A site that may have a high PageRank today could have been hit with a bunch of Google penalties and you don’t even know it because PageRank is not updated on a daily basis. The bottom line is this: You need to be in control of your guest blogging efforts as they relate to PageRank and thematic linking. So far, we have established two things: 1.) PageRank is really only important when the inbound link to your site is about the same thing–the same theme–as your web page content. 2.) An inbound link from a similarly themed webpage is great…and even greater if the source site has a high page rank. At Ultimate Guest Blogger, you can achieve this situation, the best of both worlds–inbound links from similarly themed webpages with a high root PR! 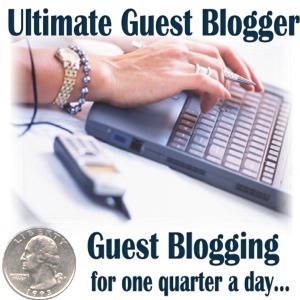 Ultimate Guest Blogger offers many public blogs with a high root PR. But the secret, the secret that few people know, the secret that only Ultimate Guest Bloggers know, is that you have the ability to control the theme. If you want to maximize your Guest Blogging success, you must employ the secrets of insiders, the secrets of Ultimate Guest Bloggers.